You are currently browsing the tag archive for the ‘Rutledge Chapel’ tag. Kaycie and Todd are so fun and happy, it was only natural that they picked a bright, cheerful color scheme for their spring wedding. 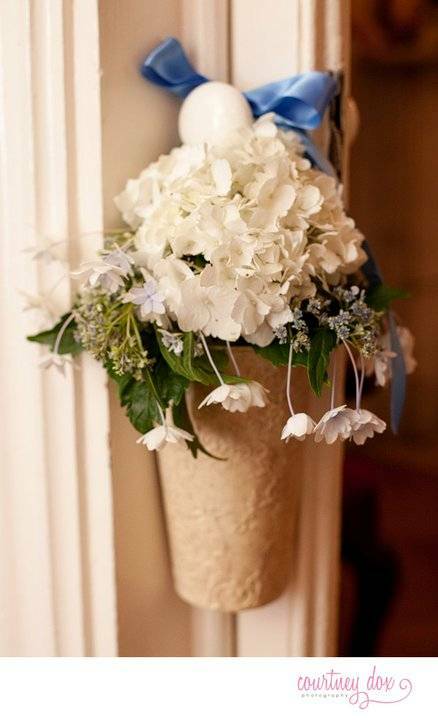 Lots of hydrangeas in blue and coral plus details like the custom monogram and lantern centerpieces added just the right touch of the couple’s fresh style to their beautiful traditional southern venues. The ceremony was at Rutledge Chapel on the USC horseshoe. 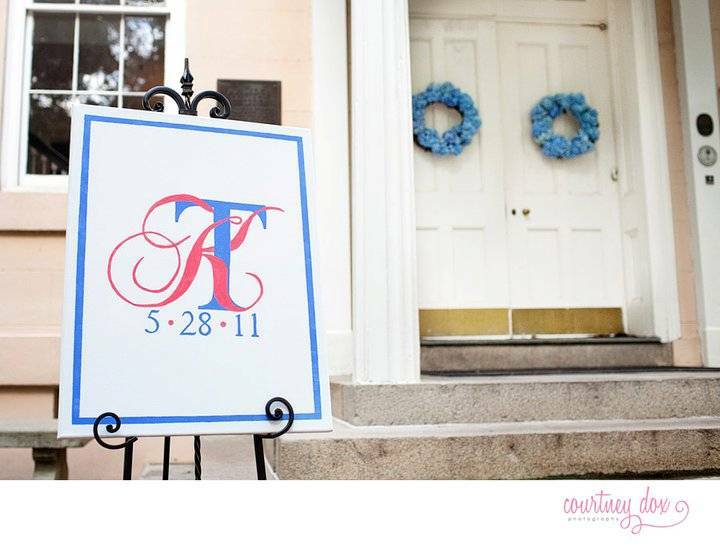 The talented Kaycie loved their beautiful monogram, so she handpainted this canvas to mark the entrance. 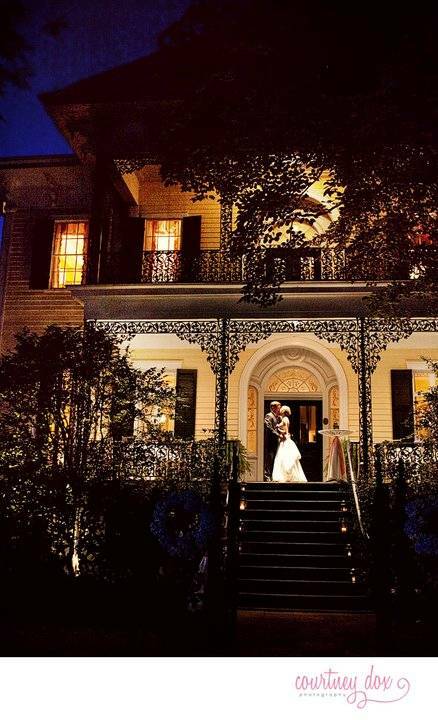 The Lace House, where the reception was held is such a gorgeous venue. 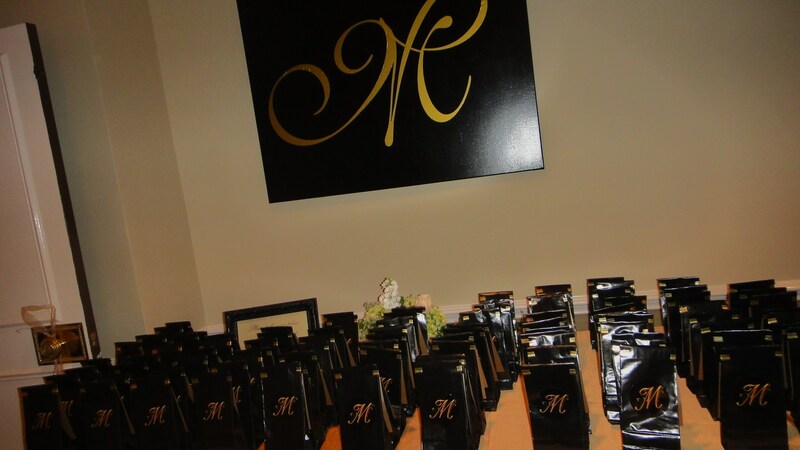 We placed tables on the balcony overlooking the dancefloor, and to continue with the monogram theme, we wrapped the ceneterpiece cube vases with ribbon topped with a printed monogram. 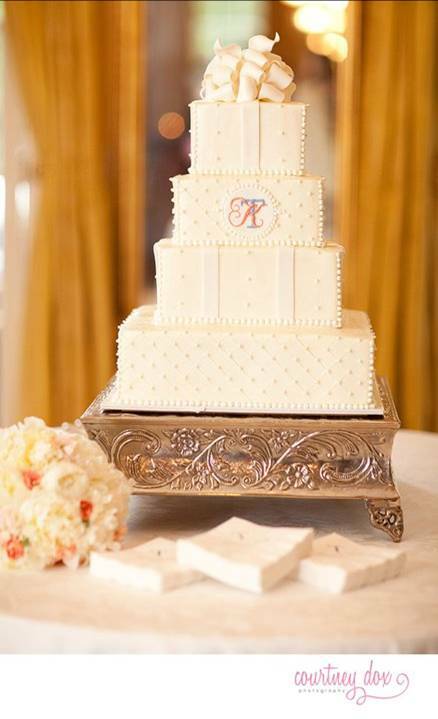 Parkland even created the monogram perfectly on the cake. 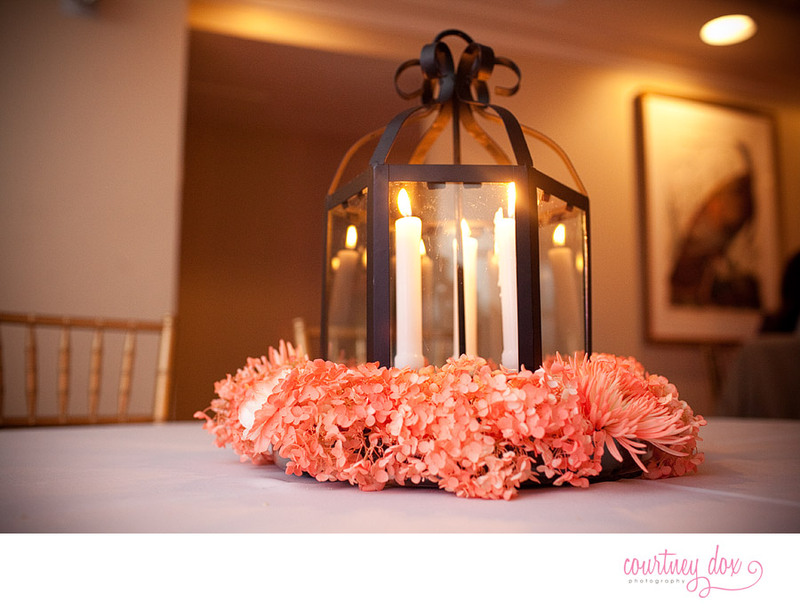 For downstairs tables, we used our black lanterns in the center of flower rings created by Bloom Service. 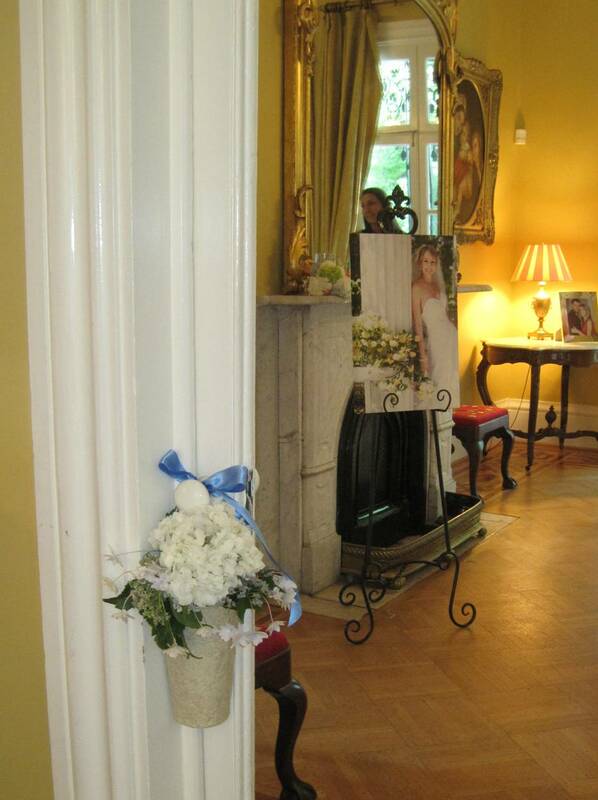 The bridesmaids’ bouquets spent the reception in vases on the gorgeous mantels in the Lace House. 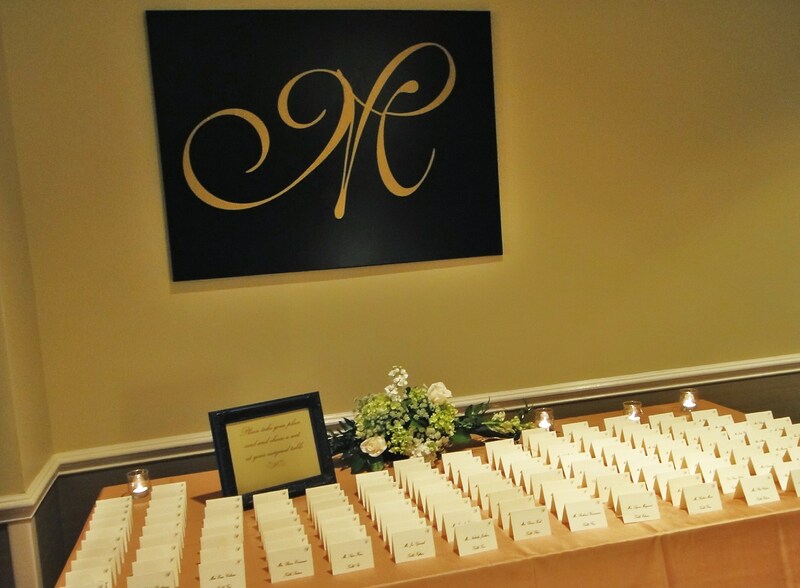 After the ceremony, we brought the pew marker arrangements and hung on the doors throughout the house. Love this view from the DJ tent once the reception was well underway. 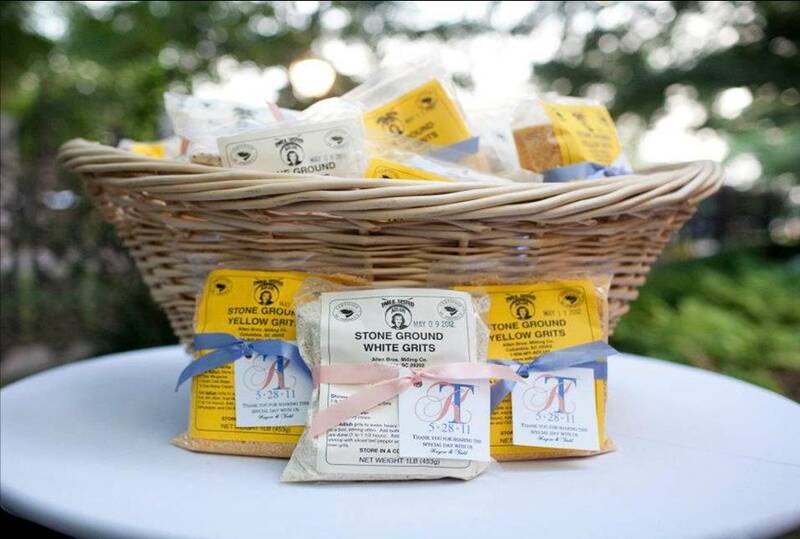 One of my favorite favors ever…Adluh grits! Gorgeous, gorgeous shot by the amazing Courtney Dox. 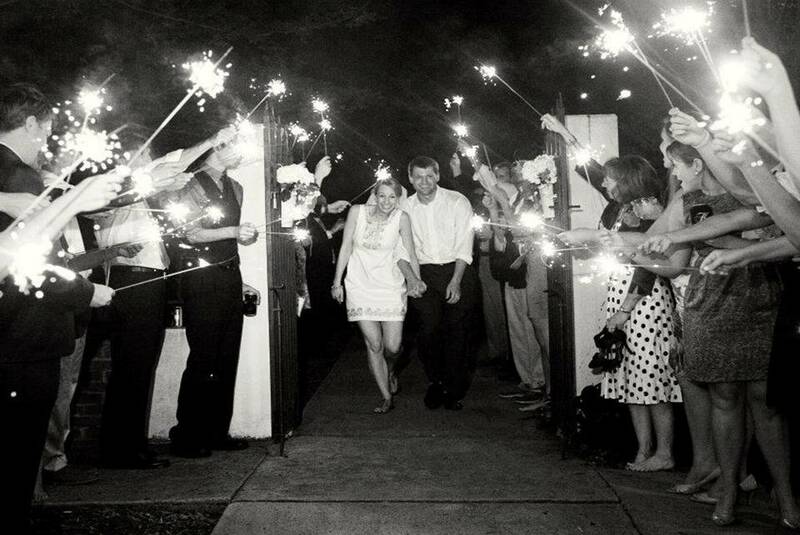 And the finally, the sparkler exit! The ceremony was held at the Rutledge Chapel on the USC Horseshoe. 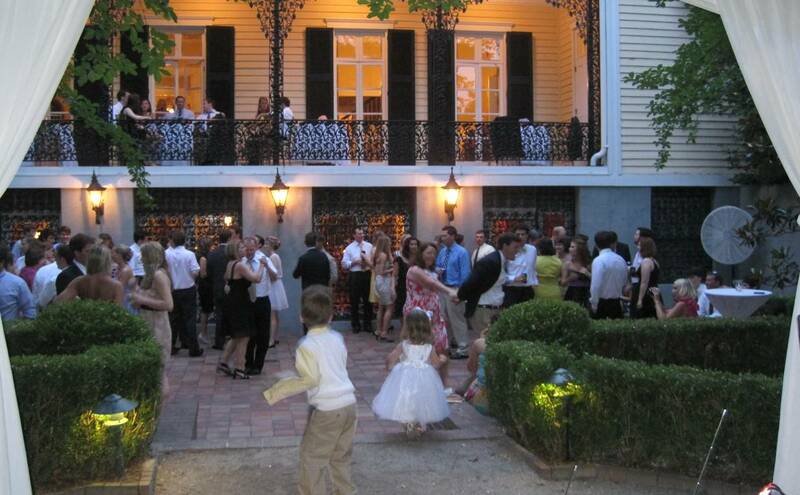 Reception was across the way at the USC McCutchen House. 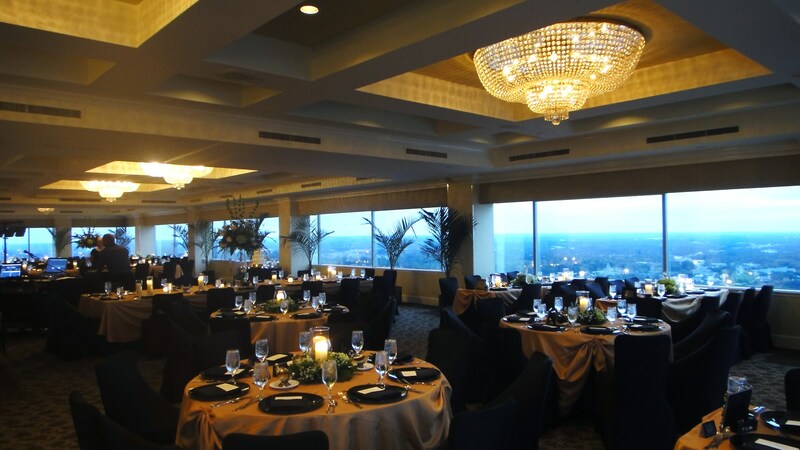 After a moving ceremony the couple joined their intimate group of wedding guest for an amazing dinner created by Carolina Catering. After dinner- they all danced to the sounds of the wonderful Coastal Breeze Band!!! 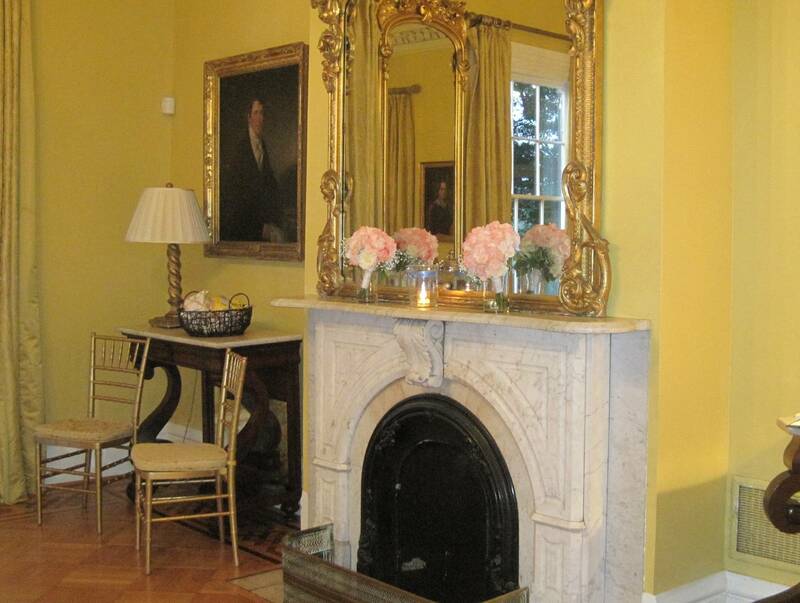 The couple chose a perfect color palatte of navy, gold and white, which was just wonderful for a late summer wedding and the richness of the McCutchen House decor. Tiffany selected all white flowers for the wedding and reception- Southern Stems created the most gorgeous bouquets and centerpieces. The bride’s bouquet was wrapped with rich gold ribbon that the bride specifically picked to go with her details. For reception centerpieces, the couple wanted the white floral decor to continue- each table had a specific type of flower in which the table itself was named for. 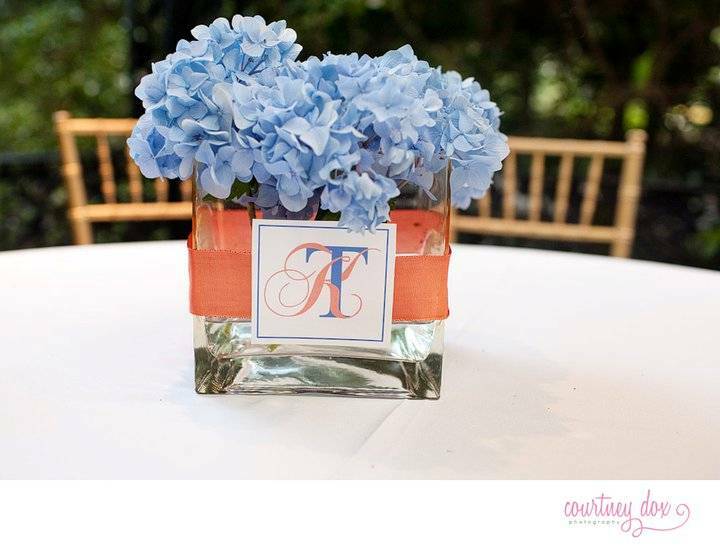 Table name displays were vintage drawings of the flowers themselves- just beautiful. 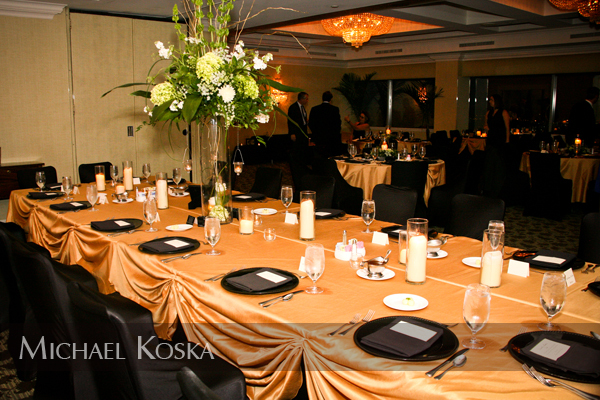 We accented each table with gold charges and a perfect Godiva chocolate cake favor for each guest. Dinner was just amazing, stuffed chicken breast, sauteed vegetables, rice pilaf all started with a crisp salad. Dinner was wrapped up with the a perfect triple berry creme brulee – a specific request of the couple!!!! 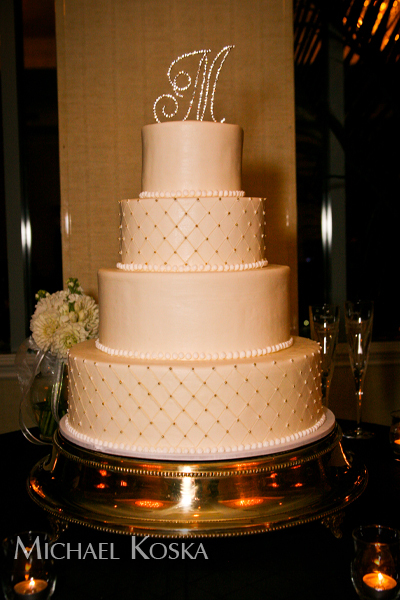 The wedding cake was so amazingly tasty and beautiful- created by Slice of the South. The cake was topped with a vintage family heirloom topper. All Dressed Up Photography shot of front room. The table all set- love the glads…. We really enjoy all the couples we work with, but I must say that Brandi and Todd have become something special to me. I have gotten to know Brandi over the past few months of planning and I have loved spending time with her. This couple is so full of love for each other and fun and kindness for everyone around their wedding was truly a celebration of the best kind. 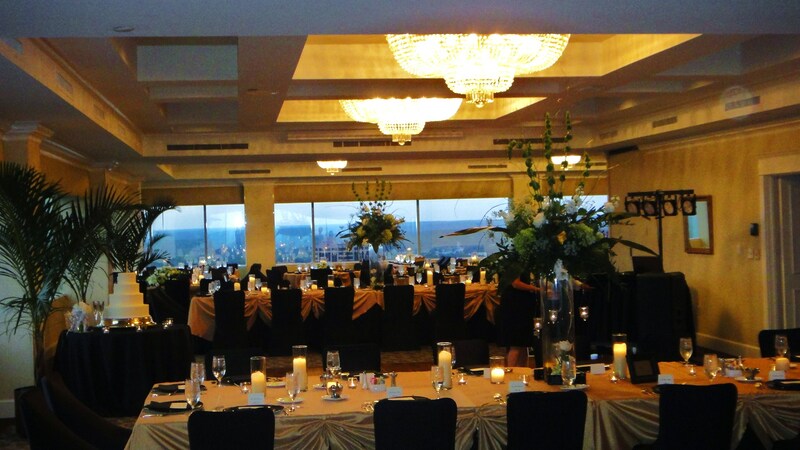 They wanted the event to be elegant and beautiful, but also lots of fun. It was also filled with extra touches that reflected their lives and personalities. I found myself laughing or smiling most of the day. The wedding was at the Rutledge Chapel on the USC horseshoe. They are both huge USC fans, so they entered the reception by running through the line of attendants to the tune of 2001 just like the football team. One of my happiest moments was watching Brandi jump up and down in her wedding dress with all the guests screaming as she and Todd got ready to make their entrance. The two of them enjoyed every second of their day to the fullest extent, and I am so very happy I got be part of it. 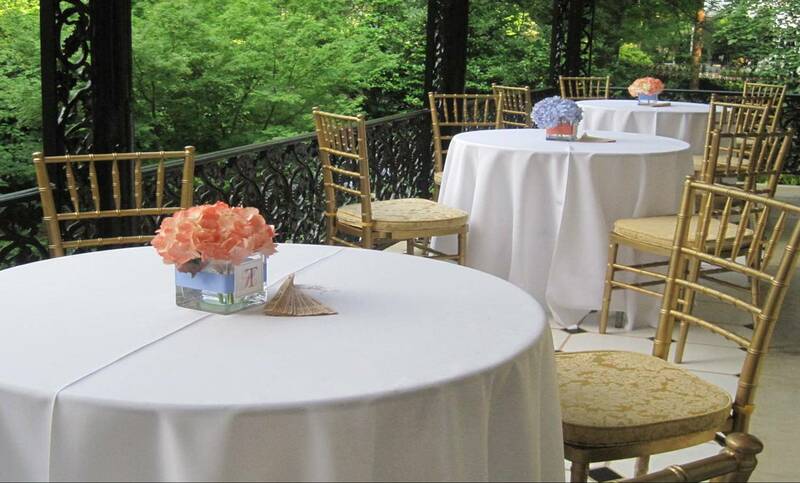 First, here are a few photos of the rehearsal dinner set up at McCutchen House on the USC Horseshoe. Todd proposed at Tavern on the Green in New York, so they wanted to celebrate that trip at the rehearsal. Here is the seating chart with a photo of the lights from Macy’s in the background. Melissa Spivey of Graphically Inclined Design did a great job on all the graphics for them. Each table was named for one of the places they visited in the city: Central Park, Tiffany’s, The Waldorf Astoria and Tavern on the Green. You can see in the window ledge photos from their New York trip. On to the wedding day! The sign they had made for outside of Rutledge Chapel. I love this photo because you can see the ring bearer peeking out the window. Because of the dim lighting in the chapel, I couldn’t get a great picture of the absolutely gorgeous flowers from Think Floral (www.taylor-west.com) This truly doesn’t do them justice. 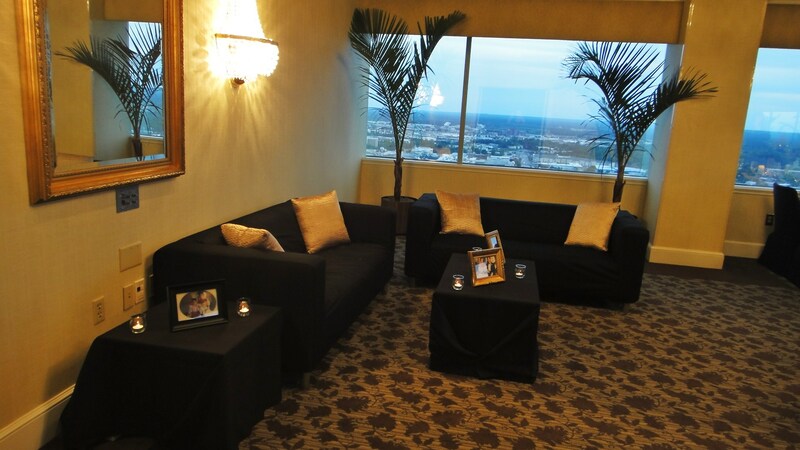 They placed the side arrangements on clear vases so they seemed to float above the columns. 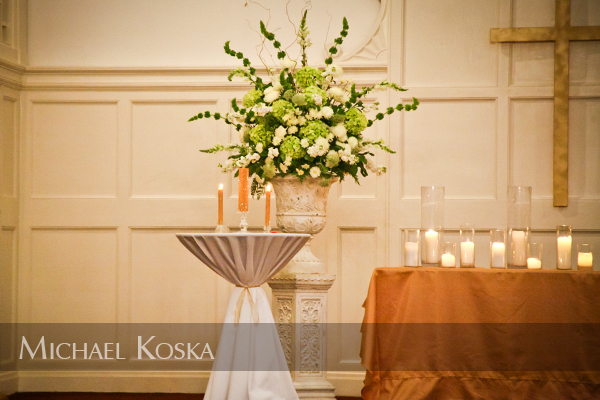 Along with the huge center arrangements and candles, it really brought the chapel to life. A close up of the bride’s bouquet also from Think Floral. Instead of a large bridal portrait, Brandi and Todd wanted to put out a mix of family photos, engagement photos and couple of small pictures from her bridal session on the USC horseshoe. For their guest book, photographer Megan Manus (www.meganmanusphotography.com) made a book out of their engagement photos with lots of room for people to sign. The reception was at City Art Gallery, and I love this photo because it captures how great the gorgeous flowers and food looked in that setting. Applause did the catering and one of the big hits of the night was the made-to-order mini-cheeseburger station. Yum! The amazing cake was from Parkland Cakes. 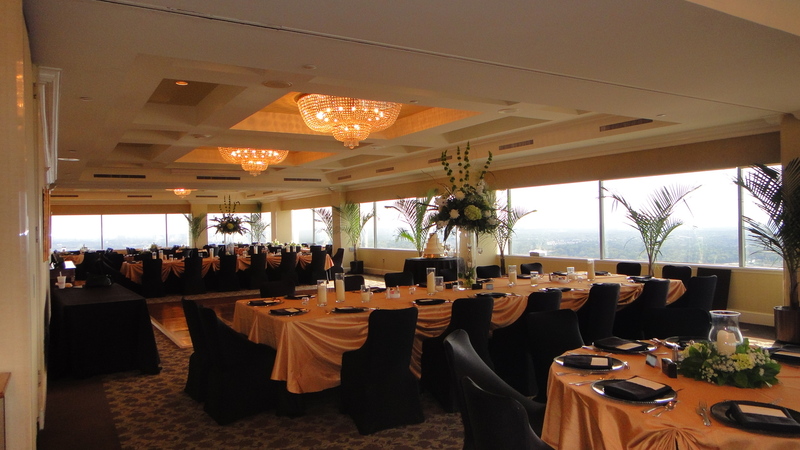 The linens are beige and brown iridescent crush fabric. City Art was decorated from Christmas, and the wreath in from the hanging lights was trimmed in gold too. You couldn’t have asked for a more perfect backdrop. I have to give a shout-out here to Palmetto Party Rentals. 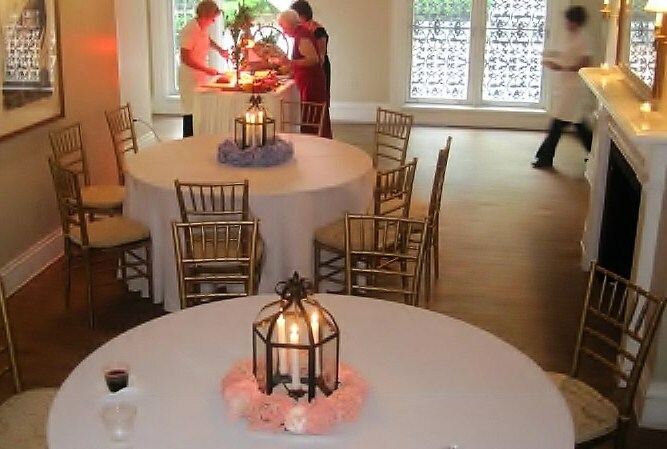 After some of the tablecloths they delivered on Friday accidentally got used at another event, they jumped in a re-delivered on Saturday with just a few hours notice so I had all my linens plus some to spare. Yay to Adam and all the folks there! The cake and table were so beautiful I had to put two pictures in. We have bride’s bouquet on the table in this one. I couldn’t get a good picture of the groom’s cake, but the bride ordered an “almond joy” cake from Chocolate Nirvana and it was absolutely wonderful. Okay – another of my favorite touches. Since Todd works for a bus sales company, they had their own personal bus to ferry the wedding party around during the day and to serve as the couple’s “getaway” vehicle.